The HX6038-NGA is a highly advanced complete constant-current/ constant voltage linear charger for cell lithium-ion batteries. Its package and low external component count make the HX6038-NGA ideally suited for portable applications. The charge current can be programmed externally with a single resistor, which may be programmed up to 1A. HX6038-NGA determines the charge mode by detecting the battery voltage: Pre-charge, constant current charging, constant voltage charging. The charge current of 0pre-charging and constant �Ccurrent charging is adjustable. 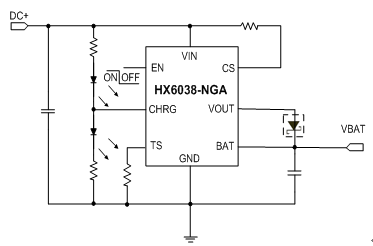 The HX6038-NGA is monitored by temperature monitor during the constant-current and constant-voltage charging. There are two LEDs indicate the charge mode. The HX6038-NGA is available in the SOP-8L package.